When it comes to baby sleep, there’s a lot of information out there. I can clearly remember, like most mothers I’m sure, the moment Kian arrived in the world. I was absolutely buried in feelings of love and happiness. And then, some hours later, I was equally buried in information and advice. This was all given to me with the best intentions, but I found it completely overwhelming. Of course, those feelings of love and happiness persist to this day, and so does the advice. There’s no such thing as a part time parent. This job is full-time, no matter if you’re a stay-at-home parent or a working parent. Our children are on our mind 24/7, no matter what else might be going on, so we tend to do a lot of research, and with access to unlimited information via the internet, it’s inevitable that we get some conflicting views. So today, I want to focus on my area of expertise, sleep, and try to dispel some of the more common myths I’ve seen in parenting groups, or heard from mums that I’ve talked with. In a word, no, with the exception of extreme cases. Unless your little one is sleeping almost all day and up all night, you probably don’t need to worry about the length of their naps. Newborns especially need a lot of sleep. In fact, up until about 6 months, I don’t recommend that your little one be awake for more than about 2 – 21/2 hours at a time. For newborns, that number is more like 45 minutes to an hour. The main thing that tends to keep babies up at night is overtiredness. You might think that an exhausted baby is more likely to conk out for a full night’s sleep than one who slept all day, but actually the opposite is true. The reason we refer to it as being “overtired” is because baby has missed the “tired” phase when they would settle more easily. And their bodies start to kick back into gear, producing more awake hormones. This keeps them from falling and staying asleep. A baby who’s had a decent amount of sleep during the day is far less likely to miss their sleep window. There are substantial variations depending on baby’s age and the length of their naps. But up to that 6 month mark, it’s really not uncommon for baby to be sleeping up to 5 hours a day for naps. So if your little one is still within those guidelines, let them snooze. Sleeping is natural, absolutely. Everybody wakes up and falls back to sleep multiple times a night, regardless of age. So no, you can’t teach a child to be sleepy. What can be taught, however, is the ability to fall back to sleep by themselves. The typical “bad sleeper” isn’t less in need of sleep, or more prone to waking up, although sleep needs can vary slightly baby to baby. They’ve just learned to depend on outside assistance to get back to sleep when they wake up. Once your little one has figured out how to get to sleep without help from outside sources, they start stringing those sleep cycles together more easily. And that’s the secret to “sleeping through the night” as most parents understand it. The idea that infant physiology is so flawlessly, naturally programmed to regulate a baby’s schedule is just not possible. Our babies need extensive care and help in their development, and their sleep cycles are very erratic if left unregulated. If they miss their natural sleep cycle by as little as a half hour, their cortisol production can increase. This causes a surge in energy, and things quickly spiral out of control. So as much as I wish babies could just fall asleep when they’re tired, it simply doesn’t work that way. That’s not to say that you shouldn’t respond to their cues, but you shouldn’t rely exclusively on them either. And if you know your baby’s wake windows, then if they start getting grumpy or showing any other cues, you know it’s time to put them down. 4. Sleep training can affect the parent-child attachment. No. And this isn’t just my opinion here. This is based on a 2016 by eight researchers from the American Academy of Pediatrics. To note, we aren’t talking about newborns here, at that age we work on sleep education as they are too young for sleep training. Trusting your child’s physiology to dictate their sleep schedule, their behaviour, or just about any other aspect of their upbringing is a recipe for disaster. Is your toddler designed to eat three pounds of sweets? Surely not. Will they if you don’t intervene? Yes! Our little ones need our guidance to help them through their early years, and probably for decades after that too. This is especially true when it comes to sleep. Some babies are naturally gifted sleepers, definitely. But don’t rely on the advice of those who tell you that babies should dictate their daytime routines. You’re in charge because you know best, even if you don’t always feel that way. 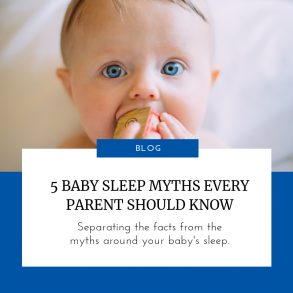 There are many more myths and misconceptions surrounding babies and their sleep habits, but these are some of the most important to get the facts on. Remember, there are endless posts on social media and websites that portray themselves as factual, but there’s nothing stopping them from making that claim, regardless of their accuracy or basis in actual scientific evidence. Google scholar is a great place to find peer-reviewed scientific study on all things baby-related, and trusted sources. It includes sources like the NHS, the World Health Organisation, the American Academy of Pediatrics, the National Institutes of Health, Canada’s Hospital for Sick Children, and other national children’s health organisations. These are excellent resources that you can feel confident about using to answer questions about your baby’s health. And if you want more information about the benefits of sleep, I’m always here to help. ← Is my baby waking from hunger?